Hello again. I have a new modding question, sorry to bother you all. So, I was messing around with Finland again and succeeded in moving the BMP-1KT (the one with the Bushmaster cannon) out of recce and into the vehicle tab without any problems. But when I tried to tone down the optics (Scanner Configuration module) and stealth (Visibility module) so that the BMP-1KT had poor for both (like most other units in the vehicle tab) instead of medium I found that any changes I made to the BMP-1KT also affected the BMP-1TJJ (the one in the recce tab with the AT missiles). Is there a reason for this? Is there some kind of link between the two units? They both have different instances in the database (BMP-1KT is 16666 and the BMP-1TJJ is 16671). It seems odd because there are other variants of the BMP-1 in the Finland deck with poor optics already (the basic transport version and the Kopa command version) but I can't seem to apply their optic and stealth values to just the BMP-1KT without messing up the BMP-1TJJ. I'm a bit stuck because I either end up with a useless recon BMP-1TJJ with poor/poor or an overpowered vehicle BMP-1KT with medium/medium! The two scanner modules are not unique per unit. Instead of editing the module, you should copy a module from a unit that has the optics you want. 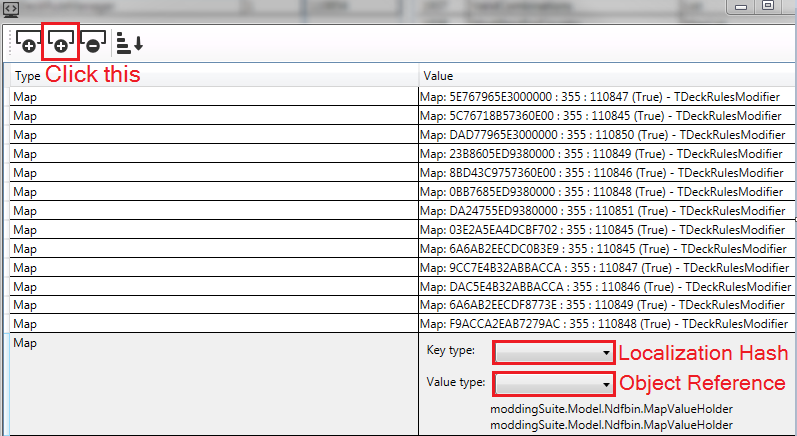 Note that some modules are unique per unit, such as CompanyUnit, TypeUnit, WeaponManager, ApparenceModel, and a couple others, but within these there can still be references that are shared. In other cases it can be best to create a new reference by duplicating a module, then editing it from there. It will take some time to learn. Ah right I get it. I need to be changing the module instance number to match a unit I want to copy, rather than messing around with the actual info contained within the module, because some units share them. Does anyone know if it's possible to add new deck types, such as the mechanized, motorized, etc? I've added a new localization entry under all the deck rules I can find but it doesn't show up when creating a deck. Also, which localization file contains these names? It shows up on the individual units and in the filter in the armory, but not when creating decks during the "Create a Deck" screen. There are a few places to add a new Localization Entry. 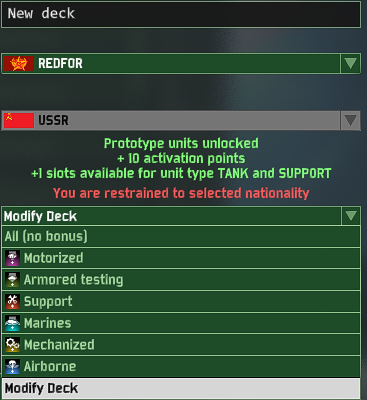 You should open ...Wargame Red Dragon\Data\WARGAME\PC\510019512\510024196\ZZ_WIN (interface_outgame) and choose a name for your deck before you continue. Everything else is in gfx\everything within NDF_Win. If we get around to being able to add new localization hashes this would open the door to creating unique restrictions for every CAT and nation. Step 2 is causing me problems... can someone re-phrase it? Where does the localization hash go in the new entry? can someone do an example and show me what it'd look like pleasE? Lexi wrote: Step 2 is causing me problems... can someone re-phrase it? Where does the localization hash go in the new entry? can someone do an example and show me what it'd look like pleasE? Here is the most up to date guide. Oh, you can do that there? Also which interface out-game should I create the hash under? There's like, a full screen of them? I assume it's dev\localisation\inerface_outgame? Or do I need to replicate it for the languages too? I was going to find out after I'd done all the other steps and seen if it works, but since you're here. I also the hashes entry need to that the form of "#X X" ? okay it asked for a entry from a drop down menu, which am I supposed to select, for the rule reference number I mean, I did TShowRoomDeckRuleManager cos that's where I put the entry but everything else in the section says TDeckRulesModifirer. Also, didn't have the tool open in full screen so I saw basically the lower half with a bunch of "object references" Silly me eh? Sorry first time I am attempting to do anything in this. Lexi wrote: Also which interface out-game should I create the hash under? There's like, a full screen of them? I assume it's dev\localisation\inerface_outgame? Or do I need to replicate it for the languages too? I was going to find out after I'd done all the other steps and seen if it works, but since you're here. When you are looking in the ZZ_Win and can see the list of all the .dic files, you can use the search bar on the top right to find only the "interface_outgame" entries. You only need to modify the one associated with the language you use for the game. When you add an entry, it doesn't have to be in any particular format. When you see a hash code (#Chi, #reco1, etc) it usually points to a symbol, such as a flag picture. Lexi wrote: okay it asked for a entry from a drop down menu, which am I supposed to select, for the rule reference number I mean, I did TShowRoomDeckRuleManager cos that's where I put the entry but everything else in the section says TDeckRulesModifirer. Copy the structure of the other items in the list. Certain lists have complex entries; if you click twice slowly on an existing entry, it will expand and reveal its structure. How would I add a unit to a country. lets say I wanna give ANZAC the M1A1 but not change the american M1A1? How would I do this? Also is there a database with all the unit numbers and weapon numbers? Zyhgar25 wrote: How would I add a unit to a country. lets say I wanna give ANZAC the M1A1 but not change the american M1A1? How would I do this? Also is there a database with all the unit numbers and weapon numbers? This is not a simple thing to explain. How familiar are you with using the Modding Suite? You cannot (to my knowledge) create a new unit, so you have to recycle an existing one, such as a depreciated unit. Your best option is to compare the unit you want to copy alongside the unit you want to copy to, then make them match. Certain things should have a new reference and others can use an existing reference. Exactly how you set this up can change the process. For example, if you want to take a PACT unit and make it NATO you have to edit extra places. I don't know of any database like that, but once you learn the Modding Suite that kind of database is obsolete. The reference numbers used to change every patch, so it was never worth the bother.